You start your self-guided coast to coast walking holiday at St Bees and follow the coastline before heading east and entering the Lake District National Park, home to spectacular lake and mountain scenery. Between the Lake District and Yorkshire Dales the Coast to Coast route levels to cross undulating farmland. From Kirkby Stephen the route climbs into the Pennine Hills and visits the mystical cairns atop Nine Standards Rigg. You continue through beautiful Swaledale to Richmond, a historic market town founded by the Normans. You leave the Yorkshire Dales and cross the low lying Vale of Mowbray to the North York Moors. From here the trail leads you on a roller coaster across the heather covered hills to the North Sea and finale of your coast to coast journey at Robin Hoods Bay. You can start your coast to coast walk self-guided holiday on any date of your choice between April and early October. Holiday price £770 per person. Holiday price £830 per person. Holiday price £890 per person. Holiday price £970 per person. Holiday price £1040 per person. Holiday price £1110 per person. Holiday price £1175 per person. Holiday price £1230 per person. Holiday price £1290 per person. The Coast to Coast is a wonderful but challenging route. You will need to be physically fit (stamina for back to back long daily walks/hikes and cardiovascular for steep ascents) and be equipped to meet your challenge. If you are unable to navigate or would prefer to walk with a group we also operate Guided Coast to Coast holidays. The Coast to Coast walk is a 190 mile route crossing the North of England. The route was devised by renowned fell walker and writer Alfred Wainwright and has become one of the most inspiring long distance walks in the world. The following is intended to provide further information about the route. Please note that all distances and heights in this document are approximate and along with all the other information are provided as an aid to describe the route. The seaside village of St Bees on the Cumbria (west) coast is the official starting point for Wainwrights world famous Coast to Coast walk. A plaque on the seafront marks the start of Wainwrights coast to coast walk. Tradition says to dip your toe in the sea and then collect a small pebble to carry with you to the east coast. The route heads north across the coastal path with views of Scotland and the Isle of Man. 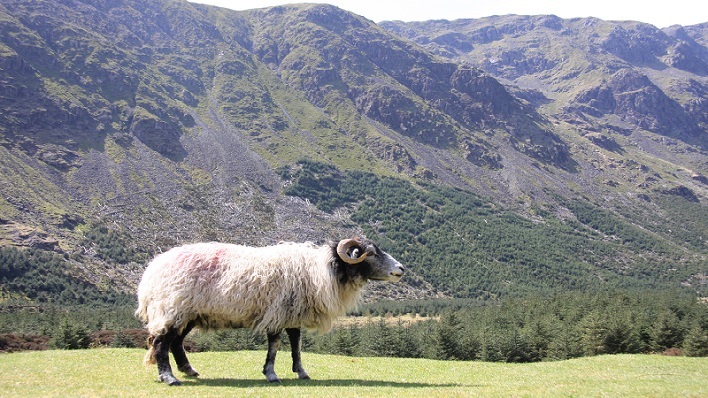 Leave the coastal path and head east towards the Lake District Mountains. The route passes through the villages of Sandwith and Moor Row to Cleator. From Cleator the route starts to climb and a steep walk takes you to Dent (352M). Admire the views before continuing across the hilltop. Descend steeply down a forest track, follow Nannycatch Beck and then the roadside paths to Ennerdale Bridge. 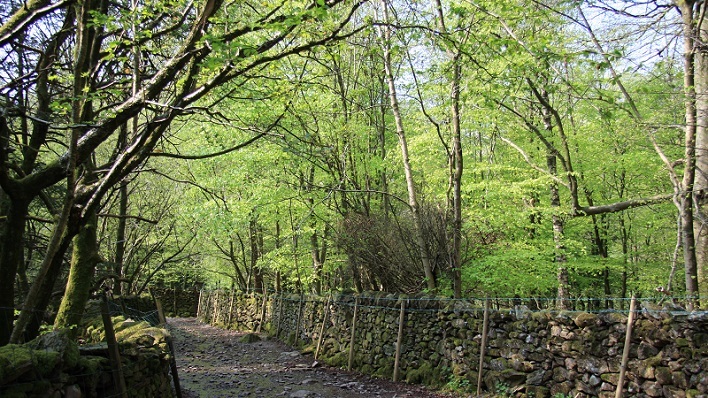 Follow the country lanes to Ennerdale Water then the rocky path along the banks of the Lake. At the far end of the Lake make for the forest track that climbs gradually along Ennerdale valley to the remote Black Sail Hut YHA (290M). The adventurous and experienced fell walkers can leave the track and climb to follow the alternative route over High Stile (807M), rejoining the main route near the top of Loft Beck. From the YHA continue to the bottom of Loft Beck and a steep ascent to the high point of the day at 600M. The views back to the sea are spectacular. Follow the rocky path across the fell and descend to Honister (330M). Continue descending into the beautiful Borrowdale valley to the village of Seatoller (120M) then follow the footpaths to Rosthwaite. Follow the track alongside Stonethwaite Beck then the rocky path climbing steadily alongside Greenup Gill. Climb the steps and rocks (a bit tricky but not technical) to the left side of Lining Crag (500M) and admire the views to the north and east. Continue to Greenup Edge, today’s high point at 620M, and then descend the rocky path to the head of Far Easedale. You then have the option to follow the ridge walk across Calf Crag, Gibson Knott and Helm Crag before descending steeply into Grasmere or take the less arduous route down Far Easedale. Follow the road to Mill Bridge then take the rocky path which climbs steadily alongside Tongue Gill to Grisedale Tarn (550M). The adventurous and experienced fell walkers can leave the route and climb higher to follow one of the alternative routes, either right over St Sunday Crag (841M), or left onto Helvellyn (950M) and then across the infamous Striding Edge. From Grisedale Tarn follow the route down hill alongside Grisedale Beck into Patterdale. From Patterdale a sharp steep walk brings you to Boredale Hause (400M), the rocky path now climbs with less gradient past Angle Tarn and close to Satura Crag (600M), it descends to 500M and then climbs sharply again to round The Knott (739M). The route then turns sharp left onto High Street, an old Roman Road, and then right onto Kidsty Pike (780M) the highest point on route. From here look back across the Lake District and then turn to view the Eden Valley and the Pennine Mountains. Descend gradually at first then steeply down to Haweswater (250M), and follow the rocky path alongside the banks of the reservoir to Burnbanks. If staying in Bampton 1.5 miles away follow the country lanes to your accommodation, if not continue onto Shap. Follow the paths across undulating farmland to the village of Shap. The Lake District Mountains are left behind and the gradients ease to cross the rolling farmland in Eden Valley. Follow the footpaths across the limestone plateau passing the secluded hamlet of Oddendale and the granite boulders deposited by ice age glaciers. Orton is a mile to the south of the route so if you are walking to Kirkby Stephen you can bypass the village. Continue over rolling farmland and across the moors passing Sunbiggin, the hidden remains of several ancient settlements, and Smardale Bridge to the market town Kirkby Stephen. Cross Franks Bridge and head for the lane which becomes a broad path onto the Pennine Moors and the summit of Nine Standards Rigg (662M). Depending on the time of year there are three routes over and around Nine Standards; green (avoiding the summit) for winter and spring, red for early summer, and blue for late summer and autumn. All routes cross peat, which is notoriously boggy in wet weather, before descending to the River Swale and the road in to Keld. From Keld you have a choice of routes. The main route stays high and crosses moorland that is scarred from a lead mining industry that disappeared at the end of the 19th century. From Keld the route descends to the river then climbs past Crackpot Hall and the ruins of Swinner Gill mine workings. It crosses the moor (580M) before dropping into Gunnerside Gill (400M) and then up onto Melbecks Moor (550M). From here a broad track descends gradually passing the ruins of Old Gang Smelting Mills to Surrender Bridge (350M) and another smelt mill. The last test of the day is to drop into Cringley Bottom, cross the river and then continue over the farmland to Reeth. The alternative route, is to follow the ‘royal road’ through Swaledale valley. The route passes through Gunnerside and a few pleasant small Yorkshire Dales villages. This is the start of the crossing over the Cleveland Hills and the North York Moors, which are covered in purple heather during late summer months. The route follows the Cleveland Way trail and climbs steadily over Beacon Hill (299M) then descends into Scugdale (100M). The path climbs steadily at first then steeply onto Gold Hill (315M). It continues onto Carlton Moor (408M) before descending to Green Bank (300M). Once again it climbs going over Cringle Moor (430M), descends to 280M back up to 400M, down again to 300M and then a final climb through the Wainstones onto Hasty Bank (398M) before descending to the road at Clay Bank Top (250M). If all the up and down seems like too much hard work there is a path that contours round the hills from Green Bank to Clay Bank. After a few miles alongside the road the route follows a track across the heather clad moors. There is another road walk and then the route continues along a broad disused track gradually descending Glaisdale Moor into Glaisdale village. The route follows the River Esk passing through East Arnecliffe Wood to Egton Bridge where it follows a once toll road through the private estate of Egton Manor to Grosmont. Grosmont (50M) to Littlebeck (50M). Distance 4 miles The road (the 1 in 3) climbs steeply out of Grosmont to its high point on Sleights Moor (285M). There are wonderful views to Whitby and the sea. The path descends through heather covered moorland in to Littlebeck. The route follows a woodland trail. After the woodland the path rises and crosses a final stretch of heather moorland before following country lanes to the coast. This time the path turns south to follow a coastal path to Robin Hoods Bay and a final last descent to the sea. Please don't forget to follow tradition once more by dipping your boot in the sea and throwing your pebble in (that should baffle the geologists in years to come). Your challenge is complete. Hi Dean & Corinna, Wainwrights C2C was everything we had hoped for, a challenging adventure in a beautiful part of the world. The accommodation was first class, the hosts warm and friendly. The trip guide and map book enabled us to navigate the long and winding path without too much trouble. A must do trek, that we would recommend to any keen walker. Hi Dean & Corinna, I just wanted to drop you a quick note to say thanks very much for organising my Coast to Coast Walk, it all went to plan and was an amazing and very enjoyable trip....Thanks again. Dear Dean and Corinna, We have recently successfully completed our Coast to Coast walk.....Many thanks for the superb organisation of the B+Bs and the transport of our luggage. This made it a hassle free journey and therefore left us to enjoy the experience. Hi Dean, We completed our walk with no (notable!) hitches and all the bookings and luggage transfers went smoothly, so thank you for your efficient organisation…… thanks again for your good work. We completed our C2C adventure yesterday and both Nancy and I can’t thank you enough for coordinating this wonderful adventure. All accommodations, luggage transfers and all other logistics that you arranged were spot on and we really appreciated all of your helpful preplanning advice and assistance with our questions. Hi Dean and Corinna, Just wanted to say you did a great job helping us with our C2C adventure in June/ July... It was so enjoyable to walk everyday, experiencing the beauty and variety of the Nth English landscape. Our accommodation was for the most part delightful, the hosts friendly, and our bags were always waiting for us at the end of each day. On a practical note, the combination of contour maps plus Henry Stedman's guide worked well, and the extra instructions for each night's accommodation were helpful. To top it all off, the weather was brilliant - constant sunshine - not what Aussies expected of the UK! Dear Dean and Corinna, I'd just like to thank you for your wonderful organisation and support for us whilst walking Coast to Coast. We were blessed with clear, dry and not too hot weather. The B&Bs you booked were spot on, with lovely friendly accommodation folk, able to share our experience and add to it. The booklet and the 1:25 map were perfect for the route. We thoroughly enjoyed the experience and celebrated with fish and chips at the Bay Hotel on arrival. What an experience, we will certainly recommend your company to any friends or family who are considering the walk. All the places we stayed were super, and some amazing. Dean answered every question promptly and politely. Thank you for a memorable and stress free holiday! Dean, Finished a wonderful holiday on Friday. Hi Dean and Corinna, Just wanted to thank you for all the arrangements you made and let you know of a few overnights where everything was outstanding…..Despite the walk being more challenging that we expected - at times it felt like hell - we did finish and also had some good times along the way. At age … I was the oldest person we met along the way and felt a great sense of achievement when I crossed the finish line. Hi Dean and Corinna, Just wanted to thank you for organising our C2C walk …..We thoroughly enjoyed the walk, helped by excellent weather. All the B&B’s were excellent. Dear Dean and Corinna, Thanks for the efficient arrangements for our walking holiday, it was most enjoyable, even the weather was good. I would definitely recommend Northwestwalks and I would use you again. Dean, Corinna, Thanks for a great holiday, we really enjoyed it. One of the best walking holidays we have done together. Part of the enjoyment is the people running the B&B’s, people you meet on the track and the scenery. All accommodation was very good to excellent, no problems at all with any checking in. All are of a very good standard each with their own features and cannot fault any. We would recommend you to anyone we know who would be doing the walk. We found you by recommendation. Hi to all at Nw walks, Just like to thank you people for organising that best walk we have had, having done five other walks with other company’s in uk and Europe. The accomodation and hosts, the information and general help was excellent....Could not knock anything on this walk. Once again thanks. Dear Dean, we finished our very successful walk last week without a hiccup and without serious problems. Our luggage was taken from BnB without a hitch and our accommodation was in the main fabulous.We are so glad we took the extra days and the rest days. I think we spoke to every cow, horse, sheep or goat as we passed. Thanks for organising a memorable trip for us. A great family bonding time. Building memories for our old age. Hi, We just finished the Coast-to-Coast walk you organized for us and had a wonderful time. Thank you. Hello Dean, thank you for all the arrangements, everything went smoothly and we only got lost a couple of times (but managed to get back on track fairly quickly!). It was an unforgettable experience for sure and we only wish the weather had been kinder! Hi Dean and Corinna, Thank you so much for organising our C2C trip we had in June. We absolutely loved the walk and really appreciated the fantastic support from you. Our luggage was always at our accommodation. Thank you for choosing such lovely accommodation for us. Thanks again for your wonderful organisation of our trip. I would highly recommend your company to others. Hi Dean- We had a terrific time on the Coast to Coast walk. The B&Bs were wonderful-each one different from the next. Everything went off without one problem and we are very grateful to you and will recommend you and your business to anyone that will listen…..I am sorry that the adventure has come to a close. It’s an amazing trip. – Maybe one of our kids will want to go again—and then we’ll have no reason to say no. Hello Dean, I completed the C2C on Monday, having booked the walk through your company. I wish to thank you for the professionalism and for the quality of the accommodation. Everything ran smoothly and the walk was fantastic. It was a wonderful adventure and I loved (almost) every moment of it. The service your company provided was exceptional. Hopefully I'll be back next year to do another beautiful walk. Dear Dean and Corinna, Thanks for your organisation of our trip and the help you were able to offer Geoff when he went lame at Ingleby Cross. All went very well……Thanks for making our trip a great success…. Hi Dean and Corinna, We recently completed the Coast to Coast that you organised for us. I'd like to thank you for making the planning and execution of this adventure so easy for us, especially with us being so far away from the UK. My brother, two friends and I had a wonderful time. The accommodation was excellent, the bag service terrific, and the maps and book provided extremely helpful (we didn't get lost once! ), and we were blessed to have only one day of rain...... We have told everyone along the way who we'd booked through, and will continue to promote your company to anyone who shows interest in following in our footsteps. Hi Dean, At the end of my coast to coast walk I just wanted to send a quick thank you for your flawless organisation of all the logistics, and for arranging such nice weather, particularly for my first week. It will definitely go down as one of the best holidays of my life. Hi Dean & Corinna, Well, what can we say!! Fabulous, amazing, unbelievable, breath-taking..... This has been the most amazing experience for us, the scenery, other walkers we have met along the way, the weather has been perfect, we actually got sunburnt & have only had 10 minutes of rain in 14 days!!! . The B & B's and farm stays, all of our accommodation has been first class , our luggage has always arrived on time, this entire trip has been faultless and we are now at The Lion Inn which is superb, this trip just gets better & better !! We cannot thank you enough for organising such an amazing tour; we have never been on a tour that has run as smoothly as this!! Thank you, thank you, thank you. Hi Dean, the trip went exceedingly well, without any problems. Thank you for organizing this for us, you even managed to have great weather for us. I will have you arrange my next trip for me, after my knees and feet recover. Hello Dean, This is just a note to say that Dianne & I really enjoyed our C2C walk (June 2 – 21). We were fortunate to have good weather and enjoyed the company of various fellow walkers along the way. The accommodation was good and …. good service for our luggage transfers…. Hello Dean. Just wanted to say a big thank you …for the magnificent organisation of our C2C walk. Accommodation was great and never had a worry that our luggage wouldn't be waiting for us!! Will happily recommend your company to our friends. Hi, Dean, Our walk went well and all the baggage connections were successful. Interesting and varied choice of places to stay... I hope to post something on the logistics of what we walked and if so will mention your company. Hello Dean and Corinna, We really enjoyed our Coast to Coast walk which you arranged for us from Aug to Sept. The accommodations were lovely and bag transfers went without a hitch. This was our first long walk and we so enjoyed it we’d like to try another. Many thanks for arranging and overseeing our C2C walk. Hello Dean & Corinna, Just a quick note to express my thanks to you for the extremely efficient and seamless organisation of our Coast to Coast accommodation and baggage transfers last week. We managed to complete the walk in the scheduled 10 days, and all the arrangements you made for us were spot-on and faultless, which was much appreciated. We may well come back and do the walk again with some others, so rest assured that we will then engage your services once again. Thank you again. Dear Dean and Corinna…. I have just returned from our Coast to Coast walk. The trip was outstanding. We enjoyed every moment of the walk. The scenery, accommodations, hosts and organization were all superb. We want to thank you for all your help in setting the trip up for us, and for your assistance both before and during the trip. We are most appreciative. Although all accommodations were great, two or three merit special comment. …In all, it was a wonderful experience. You helped create a lifetime of memories for us and for that we thank you. Hi Dean and Corinna, My husband and I were the second couple of the…party and did the C2C June/July this year. We just wanted to thank you both so much for the role you played in making this one of the most memorable “ holidays” (sort of ha ha) ever!! We have travelled in the UK before but had never really got “in to” those areas the way one can when walking – and had not expected such high quality of the B&Bs you organised – we were very impressed! The ferrying of our luggage went smoothly and every day our bags were waiting for us – fantastic! We are committed to continuing our long walks now – and I notice you offer several others.… No doubt you will hear from us again in the not too distant future. Dean and Corinna just want to let you know that we had a great time on the C2C that you arranged for us and everything went smoothly. Thank you for the superb arrangements, choice of B&B’s and bag movements – it all went flawlessly…And I will be recommending Northwest walks to organise it for them! But the quality or the walk is sensational – every single day is interesting and has plenty of variety. I can easily see why it is such a popular long distance walk. So now, what next? Well we are interested in doing some more walks, maybe next year or the year after…And thank you once again for arranging a sensational holiday, one that we will remember for a long long time. Hi Dean, I have been meaning to drop you a quick line to say how much I enjoyed the Coast to Coast walk recently. I had a great time and met some fab people ... and I didn't get lost!!!! I was also very lucky with the weather overall. Thanks again for all the last minute arrangements you made for me. Everything worked perfectly. We completed the walk last Sunday and now that I am back in the office on behalf of both of us I just want to pass on my thanks for the way that you organised out trip which hugely enhanced the enjoyment of the holiday. The only drawbacks had nothing to do with you but were entirely due to my errant map reading and road works…If I hear of anyone mad enough to consider doing the walk I will highly recommend your company. Many thanks again! Dear Dean and Corinna, I just wanted to thank you for the outstand service you and your company provided. I had a truly wonderful time on my Coast to Coast walk. It really was more than I could have imagined. I was sad when we got to Robin Hoods Bay, and was ready to just keep walking. The accommodations were wonderful and transfer service superb. I have been looking at your website and am looking forward to booking another one of your self-guided walks. Thank you again for a truly wonderful holiday. We recently used your service for the coast to coast walk. We thoroughly enjoyed the walk and would gladly recommend using your company…Thank you for your services. Dear Dean, Just to let you know that we have finished our week of walking on the C2C and everything work very well. The walking was excellent, the countryside fabulous, the accommodation pleasant and welcoming and the weather OK. Thank you for co-ordinating our walk with Liz and Alan so efficiently. Just a quick note on my return home to say thank you for the organisation of accommodation and baggage transfer during our coast to coast adventure. It was really reassuring to know that our bed and breakfast accommodation would be easy to locate, comfortable and friendly and never far away from a local hostelry for an evening meal. The luggage transfer was well organised and coped with a passenger on one day! Really appreciated your help when one of our party locked his accommodation info in his bag … Thank you Dean for being with us every step of the way! My brother Brian and I have recently completed our walking trip from 4-11 October which you organised for us - Helmsley to Robin Hood's Bay using the first part of the Cleveland Way and the last part of the Coast to Coast. We'd like to thank you very much for making it so enjoyable. All the arrangements worked without a hitch. The bags arrived when and where they should … and all our accommodation was of a good standard. We were struck by how friendly and helpful all our hosts were, with those at Sutton Bank, Clay Bank Top and Littlebeck in particular going out of their way to make sure we got the best from our stay. It was clear from chatting to other walkers that your choices of accommodation were particularly good in comparison with some others. So we felt fortunate to have been able to benefit from your knowledge of the area, and pleased that we'd asked you to do the organisation for us. We hope to be able to walk with you again! Now that we have successfully completed the C2C you arranged for us, we thank you for it. The organisation was excellent, the accommodation very good and the luggage transfers faultless. We really enjoyed the experience - or, rather, the experiences because the countryside is so different in different places - and your seamless and invisible booking and transfer services took a lot of anxiety off our shoulders. We will not hesitate to recommend you to anybody who shows an interest in copying our walk. Once again, many, many thanks. Dear Dean & Corinna, We completed the Coast to Coast walk last week and just wanted to thank you for your prompt and efficient organisation of our accommodation and smooth transfer of bags. All the accommodation was excellent and we loved the variation. Everyone we met was helpful and welcoming. We thoroughly enjoyed the walk and had no difficulties - pacing the walk over 19 days with 2 rest days is a great way to maximise enjoyment! Once again many thanks. Dear Northwest walks, I wanted to let you know that my experience of walking the Coast to Coast from May 3 to May 22 was a most wonderful time enjoyed with two friends. Your bookings and management of the whole trip worked seamlessly with luggage arriving each time. It was a pleasure to arrive at each B and B as anticipated guests and often greeted with a cup of tea and home-made cake. The facilities were all acceptable with some being exceptional and the helpfulness about attending to our requests for information or extra services were all met with politeness...Thanks for contributing to the success of our holiday and for running your business so efficiently. Hi Dean & Corinna Our group of 8 completed the C2C with everyone hiking the entire way without injury! Thank you for transporting our baggage and booking our accommodation. We thoroughly enjoyed the hike. There were a few B&B’s that were outstanding... Each of those establishments went out of their way to welcome us and ensure our stay was comfortable... Thank you for your service. Dear Dean and Corinna, We finished our walk last Thursday and wanted to let you know how fantastic it was, thanks to your seamless organisation. It was the most amazing experience and we feel we have at last achieved a major milestone in our walking. We met such super fellow walkers from Canada, USA, Australia, New Zealand and the UK and swapped blisters with them! We have many lovely stories to tell our friends and families and are already swapping photos with fellow walkers. Must come back to earth now and book another walk. Dear Dean, We arrived back home on Wednesday having all reached RHB without any serious problems, apart from a sore foot or knee... Everything went smoothly without any hitches... We thoroughly enjoyed the whole trip ... we would be happy to use your services again if we take on any more of these trails. Hello Dean and Corinna, Thank you very much for the organisation of our marvellous Coast to Coast Walk for us in August. Every day since we are talking about the experience... Walking the C2C was a fantastic experience. The landscape was very nice, the walk very relaxing. We enjoyed it a lot and think already of our next long distance walk. Dear Dean and Corinna, My friend and I have just returned home to Melbourne having completed the Wainwright walk you put together for us. I want you to know what a great pleasure it was for us to do the walk and how very grateful we are to your Company for making the experience such a happy one. The accommodation was always delightful, the hosts charming and helpful and … the hospitality was always wonderful. We loved the walk, we loved the truly beautiful English countryside, we loved the fresh air, the wildflowers, the little pubs and farms, the amazing friendliness of the people we met on the way and we loved the efficiency of the luggage transfers. I am very happy to refer your Company to my friends and I congratulate you and thank you for making our walking holiday such an outstanding success. Dean just returned from our c to c walk and wanted to give you some feedback. First let me say our group of five enjoyed this true physical challenge, and the people we met along the way, especially those at the b&b's. The baggage transfers went without a problem... and we are looking at doing future walks and will think of you guys when we do. As a member of the ‘P..t party’ which recently undertook the coast to coast walk recently can I thank you for the efficient operation throughout. The chosen accomodation was also excellent and a super time was had by all. The glorious weather helped too! We are back in NZ now and just wanted to let you know that we had really enjoyed the Coast to Coast Walk we did with your company. We appreciated the effort you put into finding us accommodation bookings at a late stage in the season and have to say that all the accommodation met or exceeded our expectations. It is certainly a challenging walk, in NZ terms a "trek" but with guidebook and maps, the GPS we had with us and the help of other walkers we found our way and were able to enjoy the range of scenery and terrain the walk offers. The movement of our bags was so efficient... A bonus was we had good weather and met some great people. Can I take this opportunity to thank and congratulate you both on your North West Walks business and the amazingly smooth operation that you have created. We have had the most wonderful experience, in some gorgeous weather (that really helped!) and met some delightful locals along the way as well. The Brits really do take their walking and outdoor pursuits seriously don't they!Each B&B and hotel that we stayed in were well appointed, brilliantly placed (always on the way for the next days walk, or at a point where we easily linked up - which helped our next days planning), with friendly knowledgable hosts as well. Our walk was completed over 17 days with three rest days built in, which we really enjoyed and which gave our legs and feet some well needed rest, as well as allowing us time to soak up three lovely towns and villages. The luggage always arrived (or in Keld arrived straight after we did) before we did and that operation in itself was fantatsically managed (so thank you to those businesses also). Can I wish you both well for the future and encourage you to continue to provide such a seamless experience for your clients. For us, this holiday was the best we have had and we are both extremely happy and proud to have walked such a fabulous route and had such a brilliant experience along the way. As we describe it to our friends, now that we are home I am confident that more Aussie business will be coming your way over the ensuing years. Again to both of you, thank you. This is a very big thank you for setting up and booking the necessary details of our Coast to Coast walk. Everything went perfectly! We were very pleased with the accomodations that you selected for us, and the daily baggage transfers went flawlessly. The guidebook and the maps that you supplied were also excellent, and we made great use of them. We were also very pleased to discover that each time we arrived at a new location the proprietors were expecting us and greeted us by name. They also spoke very highly of you and your operation. We are aware that you can't actually take credit for the weather, but as it turns out, that was fantastic as well. All in all this was our best holiday ever, and we're hoping to come back next year to do it all again! Thanks again, Dean and Corinna, you did a fantastic job! This is to thank you for putting together a wonderful walking holiday for us. "The B&Bs we’ve stayed in have all been beautifully presented with comfortable beds and clean linen. The hosts have been invariably pleasant and usually happy to chat about themselves and their town or village. Some have been tiny cottages dating back to 16th century; a couple have been in large Victorian villas. Some hosts have been obsessively neat and controlling; one was a bloke’s B&B – a pint of beer and a discussion about 1990 Mercedes cars; one was run in a 16th C pub that was much bigger on the inside than the outside but the ceiling beams were built for Kerry’s height rather than Gordon’s. All looked after us with a solid breakfast that generally kept us going until dinner with a few snacks during the day. Dinner was sometimes memorable, like steak and ale pie at Ennerdale Bridge, Thai ginger fish and stir-fried veges at Broughton, filet Rossini at Richmond, fish pie and turbot at Robin Hoods Bay. And lots of great beers." Please thank the B&B owners. Just a quick note to say thanks for making possible our Coast to Coast holiday which we found to be a richly enjoyable experience. We would like to compliment you all at Northwestwalks for a friendly and efficient service and hope to use your services in the future. One week on, just wanted to say how much I enjoyed the walk. Your organisation was perfect and everything went to plan. I have recently completed the C2C. The biggest compliment I can pay to you is that you provided info up to the walk and I never had cause to contact you again. All went smoothly, I enjoyed the B&Bs and the luggage transfers went without hitch to add to a wonderful experience overall. Got the long distance bug now so will be in touch again I am sure. We have just returned to NZ and reflect on our walk. We thoroughly enjoyed it. The B&B's were very good...If we were to do it again we would build in one rest day somewhere....You are so fortunate in the UK in having so may walks/pathways to follow and do. So thanks for what you did for us and we have already recommended you to others. A follow up note after our successful C2C walk. Everything went perfectly, without a hitch....B&B drying facilities were usually very good, some superb, and we had no trouble getting some washing done from time to time. The B&Bs were almost always excellent. We were lucky enough to be sole occupants at a couple of farm-type accommodations which meant huge rooms and top-class service. Owners were usually helpful with lifts to pubs, etc....Finally, thank you for the excellent service, and we will have no hesitation using you again if possible, and we have already recommended you to friends. We used the services of Northwestwalks for our recent self-guided Coast to Coast walk. We were most pleased with all of the accommodations and the luggage shuttle. Thank you for arranging everything so that we could focus on the walk. The weather was not the most hospitable, but it all added to the experience of the journey and will certainly allow us to embellish our tales to friends and family! Just wanted to send a brief note to thank you for the work you did to arrange the itinerary, lodging, and baggage transport on our coast to coast walk. The accommodations at every point were incredible! Beautiful lodging, great hosts, amazing food! The baggage arrived without hitch. Thank you thank you...everything was fantastic! Just a quick e mail to say thank you we had a fantastic walk all went well and the quality of the accommodation was spot on, thank you. 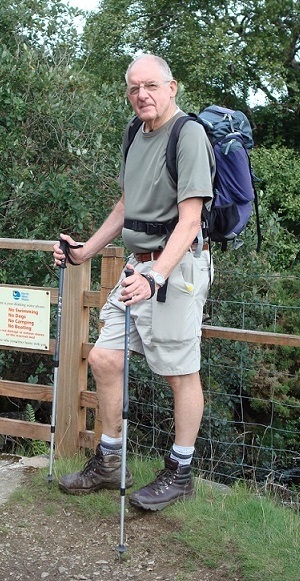 I've just completed the Coast to Coast walk which I booked through your company. Just a short message to say that everything was spot on...Food was excellent everywhere and walkers' needs well catered for. The luggage moving was also excellent with my suitcase waiting for me at every location. Thank you for making a truly memorable holiday made very easy!! thank you for all your hard work, all the transfers were bang on time and our bags were waiting for us at the end of each day, a brilliant service we will certainly be recommending you......This was our first walking holiday which was made better by your knowledge and attention to detail. Thank you for all your hard work, very much appreciated. I recently completed this Coast-to-Coast with a couple of friends. All three of us wanted to say a big thank you to NWW for a superbly organized holiday. Luggage transfers worked like clockwork and we were very impressed by the standard of accommodation, which was above our expectations. So many of our landladies went out of their way to make us welcome and help us on our way. We traveled at a fairly gentle pace, had a great time and took home lots of memories. Thank you both once again. Got back from our vacation last night and just wanted to drop you a great big THANKS. It was wonderful and mainly in part to all that you did. The B & B's, pubs, and inns were perfect with all the hosts kind and very helpful… It was a great experience and we will recommend you to anyone we hear of going that way. Thanks again so much for all your help in planning our trip we appreciate it. I want to thank you for helping organize our recent (August) coast to coast walk. We had a memorable holiday made all the more enjoyable by the standard of accommodation arranged on our behalf. Without fail our hosts were friendly and helpful and the daily luggage transfer was faultless. Even the weather was kind to us. I just wanted to say thank you for an amazing adventure, the accommodation was excellent and the staff at all the locations were helpful and friendly, all of your arrangements including bag transfers made what could have been a challenging trip carefree apart from a few blisters. Thanks again for everything; we will be using you again for the next adventure. We are home and starting to get over jet lag, so I wanted to take this chance to thank you for the well-organized and great trip you put together for us. The B&B's were very good… The logistics for trips like these are complicated and it all went smoothly. Our bags were always there waiting for us and the proprietors were always expecting us. Thanks so much. Well we completed the Coast to Coast on the 10th July and felt we must write and say THANK YOU! We found the service that North West Walks provided to be excellent, reasonably priced and without exception the B&B’s we stayed at to be extremely comfortable and the hosts friendly and very obliging…. Thank you once again and we will have no hesitation in recommending your company to our walking friends in Australia. Just a quick email to say a huge thank you for enabling me to complete the Coast to Coast walk recently. It was a wonderful experience - unforgettable. Thank you for all your help in booking my accommodation & transferring my luggage. It all went without a hitch. I am now thinking of doing the West Highland Way & I'll definitely book it with you if I do decide to do it. Many thanks again - see you next year! We completed our Coast to Coast to walk on Sunday. We just wanted to let you know that it was a wonderful experience for us and that all the arrangements made by you worked like clockwork. So thank you very much for all your organisation - we appreciated it all immensely - including the selection of B&Bs and hotels. We would not hesitate to recommend your company to friends. Recently my son... and I with Steve as the guide completed the Coast 2 Coast walk. We were both blown away by the experience and would like to sincerely thank you and your company for making our adventure so enjoyable…your advice about being prepared and equipped for the walk was correct. Hoping to be back soon to tackle another walk…soon. We thought you might like some feedback as we have just returned from doing the Coast to Coast booked through you. All of your arrangements were excellent and we were very pleased with the high standard of B&B accommodation. The transfer of the bags went very smoothly …Your instructions and other paperwork were very clear…Some of the B&B’s were exceptional…All in all, some very good choices by North West Walks. We were recommended to your company by our friends…we would certainly recommend North West Walks to others. With many thanks. We have successfully completed our Coast to coast and want to thank you for organising it for us. Everything went perfectly to plan - our bags always waiting for us and the accommodation and breakfasts were all very good and a few even exceeded our expectations. It was a fantastic experience with wonderful walking and … we had great weather and did not want to stop walking! Just wanted to say what a great time I had doing the coast to coast walk between 18th April and 30th April… the whole trip was great and I'm grateful to North West Walks for organising it all for me… It was an awesome experience. Just returned home from our UK trip which included the Coast to Coast walk booked through your company. Thought I would write to say how much we enjoyed the walk and although strenuous the fantastic scenery and friendship among walkers met along the way made it a most wonderful experience. The walk was made all the more enjoyable due to the excellent B & B's and luggage service. Thanks a lot myself and my son had a great coast to coast walk. And we were well looked after at the Bed and Breakfast would recommend your company to everybody. David and Mark, UK, Coast to Coast Self-Guided, 2010.